If you haven’t seen it (and without giving anything away) the movie is set in a town called Cheesebridge and the people of the town ADORE cheese. So, taking that as inspiration, we decided to create a cheesy popcorn treat for our movie night. But not your typical Day-Glo orange cheese popcorn. No. I wanted a much more ‘adult’ flavor profile. The ingredients were really simple. I used block parmesan and shredded it myself (the finer the shred the better since it will melt more effectively) A microplane would work well, or the type of parmesan that comes in a shaker bottle would do the trick as well. I used dried rosemary and bottled garlic, but you could substitute fresh. In a large soup pot you want to infuse the oil with the garlic and rosemary over medium-low heat. Next pour in the popped popcorn and stir WELL, until you can get oil to cover as much as the popcorn as possible. 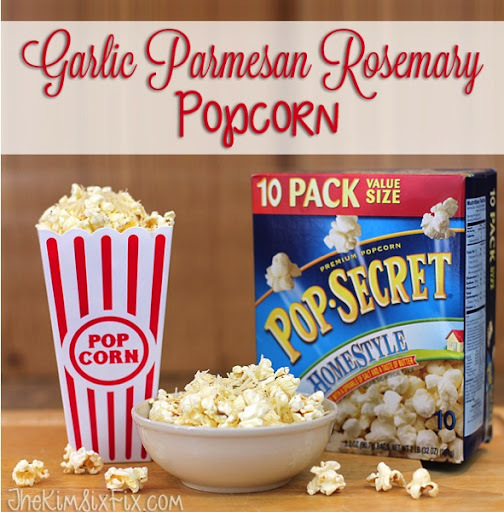 That is the only way you will get the wonderful garlic and rosemary flavor. I actually found it was easiest to add a lid to the pot and shake it around so that all the popcorn was evenly coated. Finally, and while the popcorn is still warm, sprinkle the cheese over the top allowing it to partially melt. It definitely kicks your standard bowl of popcorn up a notch! It is the perfect movie treat to go along with The Boxtrolls. You can create your own movie night at home with Pop Secret and The Boxtrolls by picking them up at Walmart, while supplies last. And you can find other great movie night ideas on The Boxtrolls Facebook page.